I woke up this morning at, surprise, 6, before getting ready and eating breakfast. Scott brought out the lionfish to thaw before we began our dissection. Elena and I had two pretty small ones, names Bambi’s mom and Mufasa that we weren’t able to glean too much info from, but the dissections were still pretty cool. After, we had a really great time chilling in the hammocks and playing with the volleyball while Scott prepared the fish. We all took a taste of the lionfish ceviche after, which was pretty great. We ate lunch then I took some time to pack up my stuff, which was difficult because I managed to put stuff in every building. Afterward, we all packed up on the boat for one last outing to a resort on Southwest Caye. There, we chilled in the Tiki Bar, took photos, and danced with Rose. 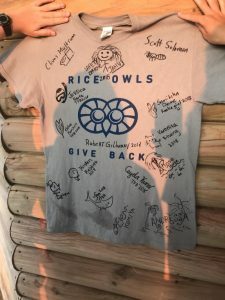 We all signed a t-shirt that would stay at the bar with little drawings of our time here. Overall, it was a really great way to celebrate all that we’ve done. I woke up to thunder and rainy skies, which was a surprise since last night was the only clear night we had had. I went to the lecture hall to work on blogs before traversing the flood to go to breakfast. We all came to the lecture hall for our last round of lectures by Claire on crustaceans, Jessica on sponges, and Elena on mangroves and sea grass beds. Scott gave us our topic for today, which would be to look into marine debris. We decided to look into the different compositions and amounts of trash on the windward and leeward sides of the island. 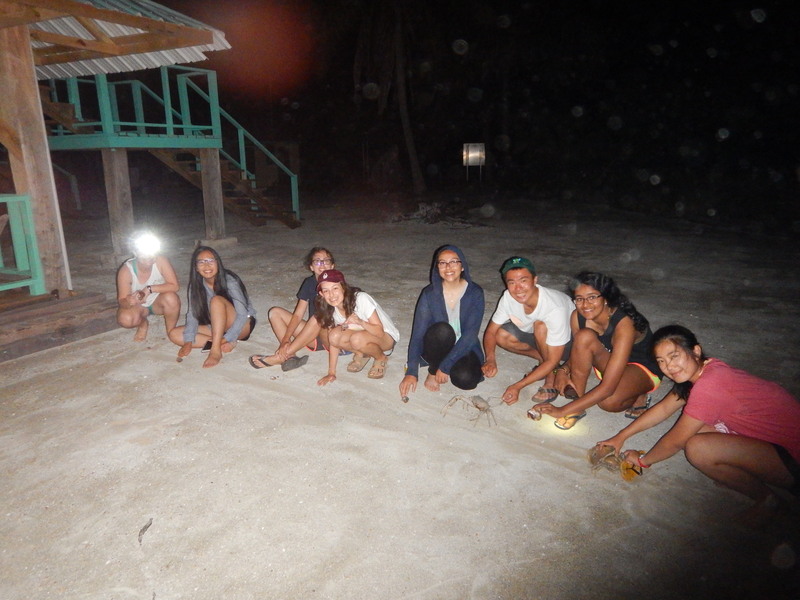 We headed out to the dead coral graveyard to start collecting the trash for 15 minutes. The amount of trash was really disheartening, but we tried our best to pick up as much as we could in that time. We sorted as we went, with Andressa writing it down. We finished up the windward side and moved to the leeward side where we repeated the process. We were all pretty sad after, but lunch cheered us right back up again. After lunch, we geared up for our last boat snorkeling trip. We went to the Aquarium, which was an area of patch reefs with a bunch of cool fish, a deeper spot above a coral reef, then a shallow sea grass area. We got to see a lot of great species, like a reef parrotfish an eagle ray, another donkey dung sea cucumber, a starry eyed hermit crab, and, most appropriately, a nurse shark with a plastic bottle attached to its fin. We swam around for a few hours before getting in the boat and heading back for dinner. We finished working on our poster of our findings from this morning, titled Talk Dirty to Me, and presented to Scott. Afterwards, we all hung out in the lecture room to finish up our blogs and notebooks and listen to everyone’s surprisingly great taste in music. 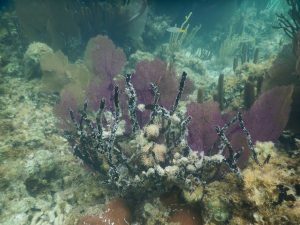 Corallimorphs, Zoanthids, and Anemones seen: 4 giant Caribbean anemones, all larger than the ones yesterday at over 15 cm and hidden in the crevices of the shallow coral reefs. 1 flower anemone on the side of a reef in the 1st dive spot, next to fan coral at about 5 cm at the opening. 1 yellow polyp rock seen on top of a piece of dead coral, about 50ish polyps on it. 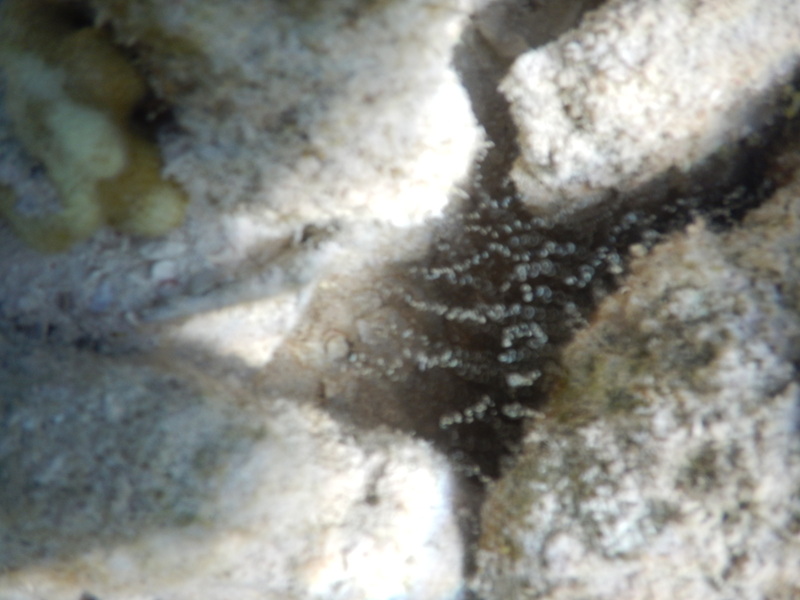 2 White encrusting zoanthids, both on the bottom of the benthos, not surrounded by anything. One was about 75ish polyps and the other was a few hundred. I woke up at 3:45 this morning to prove that I was able to naturally able to wake up at whatever time I wanted before waking up at 6:00 to actually start my day. We ate breakfast before moving to the hammocks to work on our poster on our findings from day 10 and 11 about the hard coral coverage and sea urchins. We spent about three hours analyzing our data and writing up our poster before presenting to Scott and Javier. Afterwards, we started lectures with me giving my presentation on corallimorphs, zoanthids, and anemones. We ran out of time and had to break for lunch but came back and Sam gave his lecture on brown and red algae and Jessica gave hers on invasive species. After lectures, we geared up sans fins and waded out off the shore into what felt like boiling water. As we got deeper, the water became colder and more and more organisms came out. We picked up conch shells to look for any small creatures that we put into Scott’s bucket. 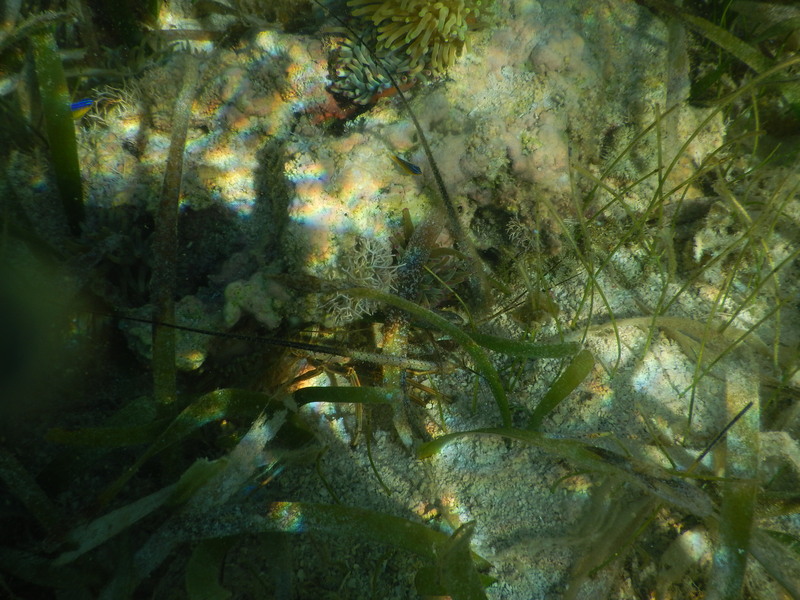 I focused on finding anemones and corallimorphs but I stumbled across a few cool green algae and conchs. We swam farther to the barrier reef, where the corals contained a ton of really cool critters. 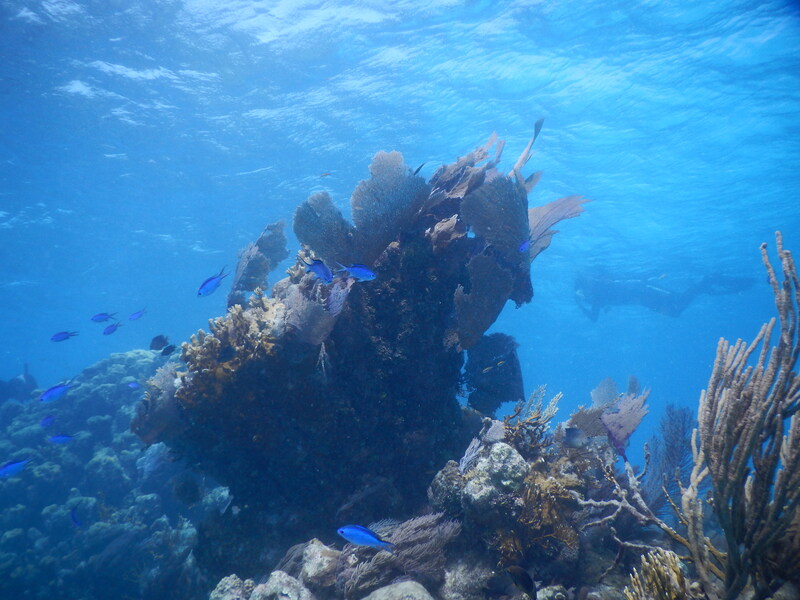 We saw two nurse sharks, a puffer fish, plenty of damselfish, a giant lobster, and some really cool corals. We swam around for about an hour and a half before heading back to the shore to analyze our creatures. We took our buckets back to the wet lab and began sorting out our taxons. We found a big surprise with two small octopi that had been hiding in our shells and a small wrasse that seemed terrified of us. 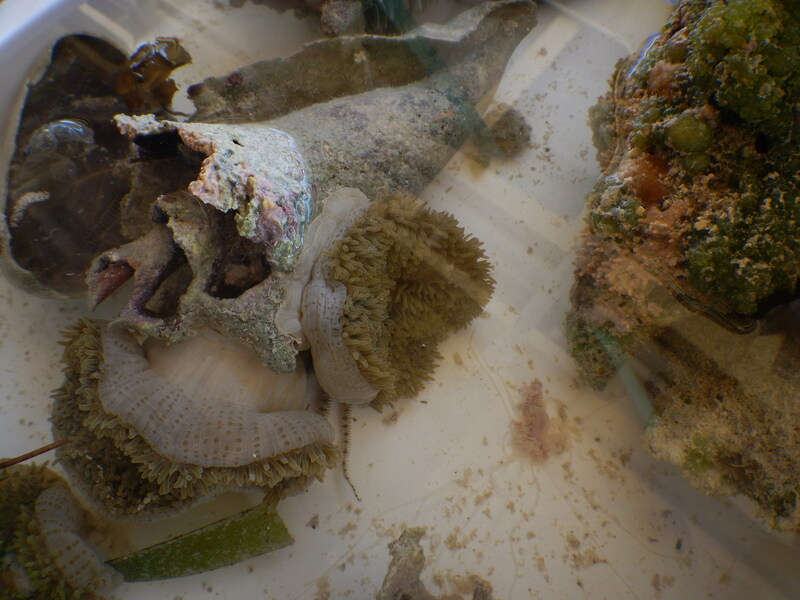 I took all of the anemones and the medusa worm into my bucket and worked to identify them. Sam, Jessica, Andressa, and Claire identified their critters as well before we presented to the rest of the class. After we ate dinner, I showered and we all sat on the dock to watch the sunset, which was really nice. After, Javier gave us a presentation on the history and culture of Belize, which was super interesting, We all chilled by the hammocks after to work on notebooks while listening to music. 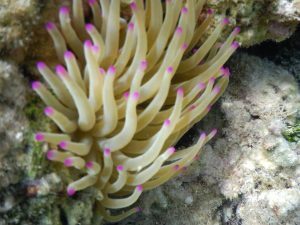 Corallimorphs, Zoanthids, and Anemones found: 7 giant Caribbean anemones seen in the shallow reef of both color morphs. They were either on conch shells or in the crevices of hard corals in the reef. They were mostly alone but a few were in close proximity to each other. Sun anemones, saw 3 10cm ones, 2 20cms and 1 40 cm one, either on the benthos or attached to rocks in the reefs. Many of these grew close to each other. Brown sponge zoanthid found in the coral near the barrier reef, hidden in a crevice. It formed a small mound near the floor of the coral. I woke up at 6 this morning and worked on my blog post from yesterday before having a great breakfast of fryjacks and mango jam. This mango jam is actually my favorite thing on the island. We went to the lecture hall where Lindolfo gave us a great presentation about the marine protected areas and what the officers here do to take care of the reefs in the area. After that, we geared up for our first snorkeling excursion of the day. 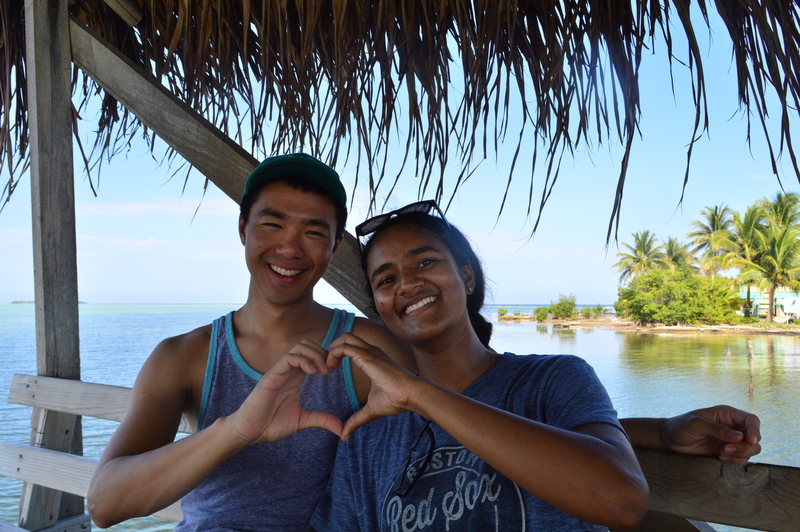 We took the boat out onto the fore reef near Long Caye and dove into the deepest water we’ve been in yet. The currents here were pretty strong, which made it hard to swim a little but the view underneath the waves was worth it. We also took some great photos of each other under the water here. We saw a southern stingray on the benthos right before coming back into the boat to go to another spot on the forereef, where we saw parrotfish, fire coral, and other organisms that I had a little trouble seeing in the water without my glasses. Everyone started getting pretty queasy after this though so we got back into the boat and headed back for lunch. After a great lunch, we all took a communal nap by the hammocks before getting ready again to go urchin collecting. We decided to use the sea urchins as a measure of the health of the MPA vs non-MPA zones so we headed out in a boat to the MPA zone from yesterday to collect first. Collecting the urchins was hard since they were spiny and stuck to the rocks but we managed to round up 74 in total, including a West Indian Egg and a Diadema. We headed to the non-MPA zone to do the same thing, this time collecting a ton of huge diadema and 76 urchins in total. After we caught them, we measured them and released them back into the ocean. After coming back and showering, we had dinner and headed into lectures, where Ceyda talked about herbivorous fish, Elena talked about piscivorous fish, and Andressa talked about Marine Debris. Afterwards, it was off to the races for the Dermit Crab Races! We went around the island to find our chosen steeds, with everyone getting a hermit crab except Sam and Elena who raced with Caribbean Blue Crabs. We made two lines in the sand and put coconut on one end to entice them. The Caribbean Blue Crabs were fast but ran off the track, which left the spot open for my large hermit boy, Alejandro, to steal the spotlight and win the races. My crab won and everyone else’s was trash. Afterward, we all watched the storm roll in and worked on our blogs and notebooks. 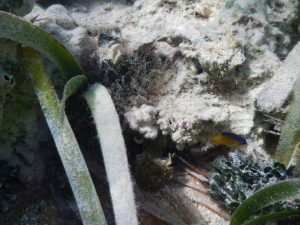 A Giant Caribbean anemone seen in the MPA zone, at about 3 ft in depth on the side of a rocky outcropping. The tentacles were the purple morph and was about 20 cm in length. 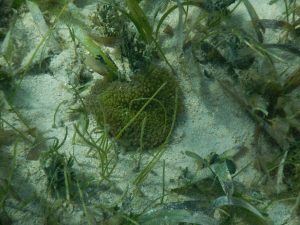 A Ringed Anemone hiding under a conch shell in the MPA zone at about 3 ft in depth. I couldn’t see the base, only the tentacles that curled up out of the side of the shell. 2 sun anemones in the non-MPA zone, both fairly close to each other on the side of a rock, about 1 ft from the surface. One fan coral close by but nothing else around them. I woke up at around 6 to finish up blogs before eating breakfast with the rest of the gang at 7, where we had the sweetest pineapple I’ve ever had. We got a chance to use our quadrat for the first time by doing a little mock experiment by counting the leaf litter on the Beck Interpretive Trail. We changed and jumped in the water to try the same methodology using worm mounds in the sea grass bed, where I may or may not have lost my clipboard which Elena promptly found. We had a little break after this so we headed to the observation tower to see the island and walked around the trails before a delicious lunch. We took a stop to the dead coral graveyard and got to see some great examples of the corals we would be seeing in real life just a little later. We changed back into our gear before heading our on the boat for out first dive outside Middle Caye. We sailed about 15 minutes into the MPA (marine protected area) zone where we decided to use our quadrats to measure the percentage of the benthos in MPA vs non-MPA areas that were covered in live coral. We used the transect and quadrat to measure our small plots of reef over 100ft. We finished pretty fast so we got to explore the reef and look at sea urchins that scattered the rocks everywhere. I might have then lost our quadrat but Sam and Rose found it so our team slogan of Will Rice Will Lose Stuff seems apt. We went a little farther out into the non-MPA zone to repeat the procedure. This area was a little deeper so we had to dive to retrieve our equipment. Elena and I finished pretty quickly again so we spent some time looking around, where we got to see a spotted moray eel. We headed back to the main island where I quickly took a shower before dinner. We got to drink from some fresh coconuts here, which came at the exact right time. We had dinner and had some down time where we worked on our notebooks and blogs and enjoyed the wind and lightning from the coming storm. We headed inside for lectures from Chloe (soft coral), Andressa (green algae) and Ceyda( the future of coral reefs). Everyone was falling asleep hard during this so we all stood up a little and Elena, uninvited, slapped me with a Clif Bar. After lectures ended, we stayed in the classroom and finished up our blogs and notebooks for the day. 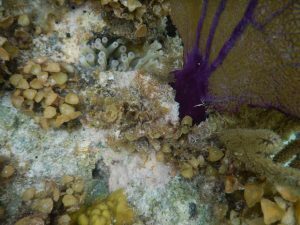 CZA found: giant Caribbean anemone in the MPA zone in a very shallow region (about 2 ft), surrounded by soft coral and growing on rock. Sun anemone in non MPA zone- it was a little hard to be sure that I saw this one because it was far away but it was in a rock cropping surrounded by hard coral in a shady edge of a reef. Day 9: Glover’s? I Barely Know Her!! We all work up around 5:40ish before packing up our things to say bye to land for a while. We ate breakfast in the dining room of the TEC and loaded up our things into the van where Eduardo helped up. We drove into Belize City, which looked completely different from the first time we’d seen it. 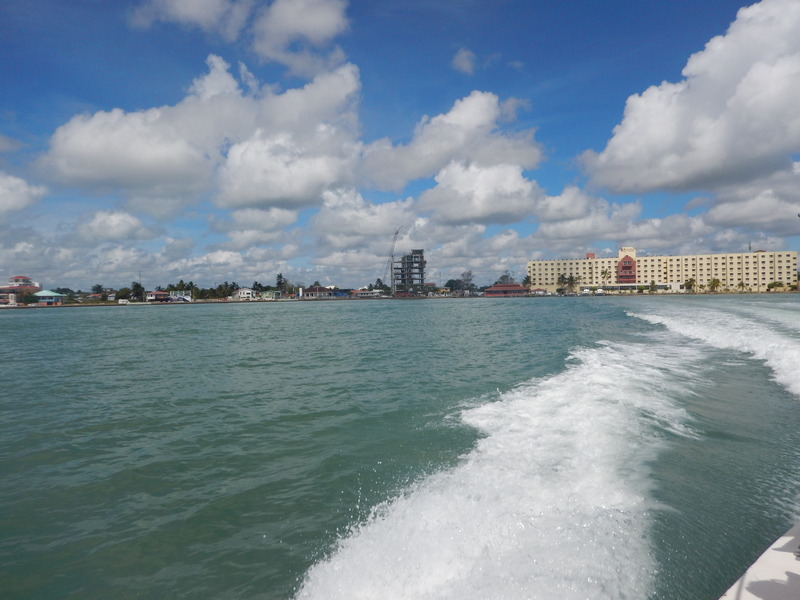 We passed through the neighborhoods and shopping centers of the city before arriving at the marina where we met our captain and water safety officers, Javier and Rose. We loaded up the boat and started the sail to Glover’s. One of the coolest part of this sail was watching the water change into every shade of blue as we went farther away from the mainland. We sailed for about 3 hours through the water and enjoyed watching the islands and mangroves pass by. The view was tranquil and a huge change from our previous views in the rainforest. We got the chance to talk to Rose, which was really cool because she has one of the coolest jobs. The water turned a beautiful vibrant turquoise as we entered the lagoon. We drove slowly over the water and could see the sand at the bottom clearly. We docked on the island and unloaded our stuff before getting to see the island. We had a great lunch and got to see our rooms before snorkeling out for the first time. We put on all our dive gear and paired up for our dive teams (I somehow got stuck with Elena I’m about to die in the ocean). We immediately almost stepped on a stingray, so we did great. We went out around the sea grass and a shallow reef to try on our gear, which was a lot of fun. We got out of the water, showered, and ate a really great dinner with upside down pineapple cake. We went for our first rounds of lectures here with Veronica doing echinoderms and the microbial processes of coral reefs and Kristen doing hard corals. Afterwards, we made our quadrant Bichael using the pvc pipes and string so that we could use it for data collection tomorrow. Afterwards, we all spent time working on our notebooks before turning in. 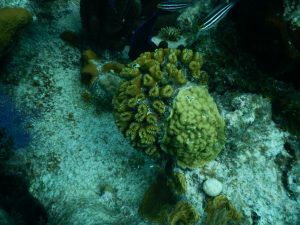 It was hard to tell them apart in the reef but I definitely saw a giant Caribbean Corallimorph about 200 ft from the dock in the reefs around the island, surrounded by hard coral. This was pretty expected as this depth is in its range. The coral reef and the rainforest are both incredible places for biodiversity. 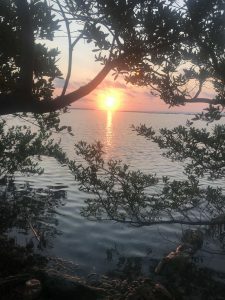 Even though the reef is dominated by animals and the forest dominated by plants, both have fundamental living structures that provide the basis for life. 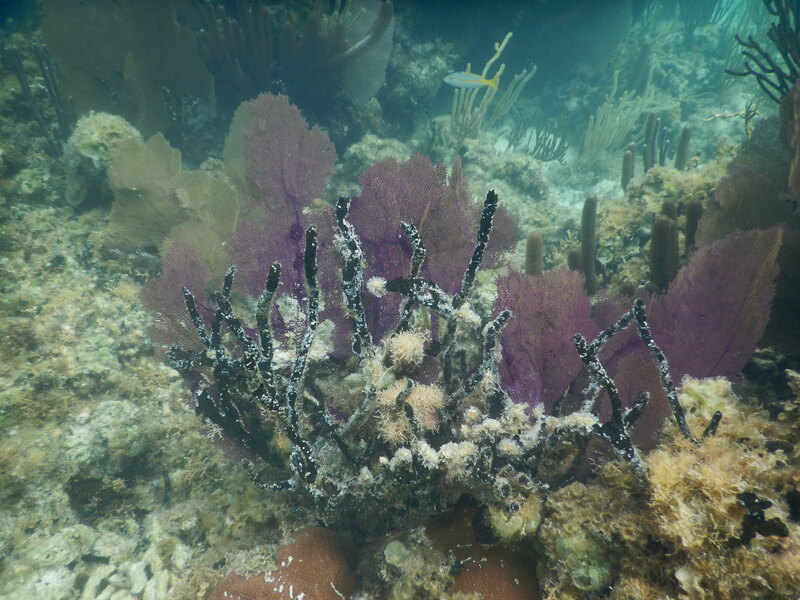 Both are nutrient-poor environments, but between trees and corals both environments have living things that host other organisms. Corals build up space in the ocean where other organisms can live, and tree canopies in the forest host birds, arthropods, and many others. These spaces also provide the basis for many trophic levels, which is why they contribute so much to biodiversity. In terms of what I observed, I have found that the rainforest had much less open space than the reefs. In the water we saw patch reefs, which were dense clusters of high diversity interspersed with more or less barren sand, but the rainforest was packed everywhere except for the man-made trails. In both cases, it was hard or rare to spot a lot of megafauna, but both places were teeming with life in any case. Three things that I learned from this trip are that there is hope for the environment, field research is hard but rewarding, and that the rainforest is less grueling than I thought. Both Glover’s and the Chiquibul have faced threats to their health, and still do, but when left to recover it seems like the power of nature to right itself after damaging influences have negatively impacted the environment. In both locations, the group was faced with difficult questions of how to answer research questions that took us hours at times. Processing data was also very difficult, but seeing our posters completed at the end was always a good feeling. Finally, the rainforest had fewer biting insects than I thought it would, although it definitely had a fair amount. It was not as hot as I thought, either. This course definitely met and then exceeded my expectations. We did a lot of experiential learning and exploring pristine natural environments like I expected, but I was blown away by the tranquility and biodiversity of these places. I also got a good dose of Belizean culture and hot sauce, which was a pleasant surprise. One of my favorite parts of the course was exploring both environments and seeing new critters, especially when one of them was from one of my taxonomic groups and I could then identify it for everyone. Our group was also a lot of fun and it seemed like we were always laughing together and enjoying each other’s company. The only bad part of this trip I can think of was the bug bites and sea urchin wounds, but even those are part of the greater story of an amazing trip. Today was an amazing day for snorkeling. We hit the water right away after breakfast, visiting three different sites that all had different things to offer. Our first spot, called “the channel”, was my favorite one because it was the deepest. We saw a few nurse sharks there, along with tons of reef fish and even a few squids. It was nice to finally get out into new waters where I could dive down and attempt to blow bubble rings, which had mixed levels of success. On those reefs, I spotted for the first time the White Encrusting Zoanthid (palythoa carbaeorum), as well as some Mat Zoanthids (Zoanthus pulchellus) and Sponge Zoanthids (Parazoanthus parasiticus). 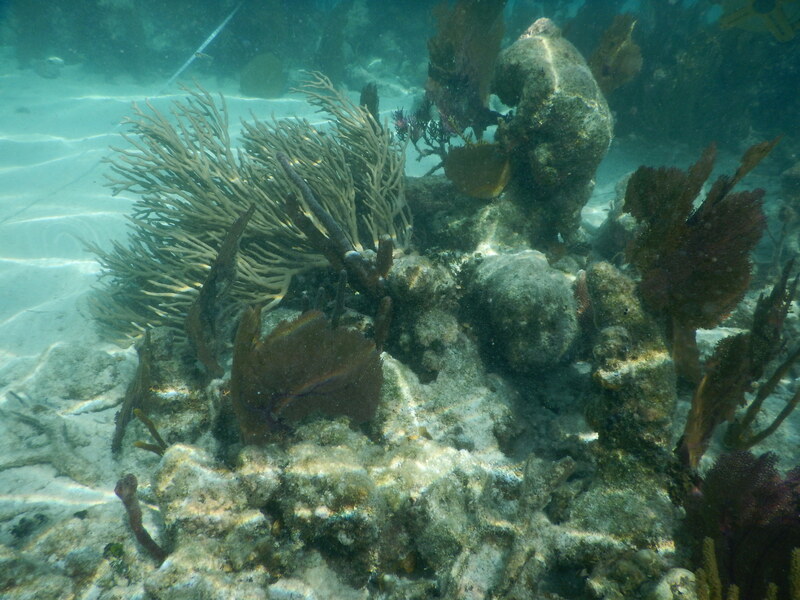 I also saw a few Giant Caribbean Anemones (Condylactis gigantea) and one Sun Anemone (Stichodacylus helianthus). Corallimorphs still manage to elude me, unfortunately. Maybe I will get lucky in the mangroves tomorrow. 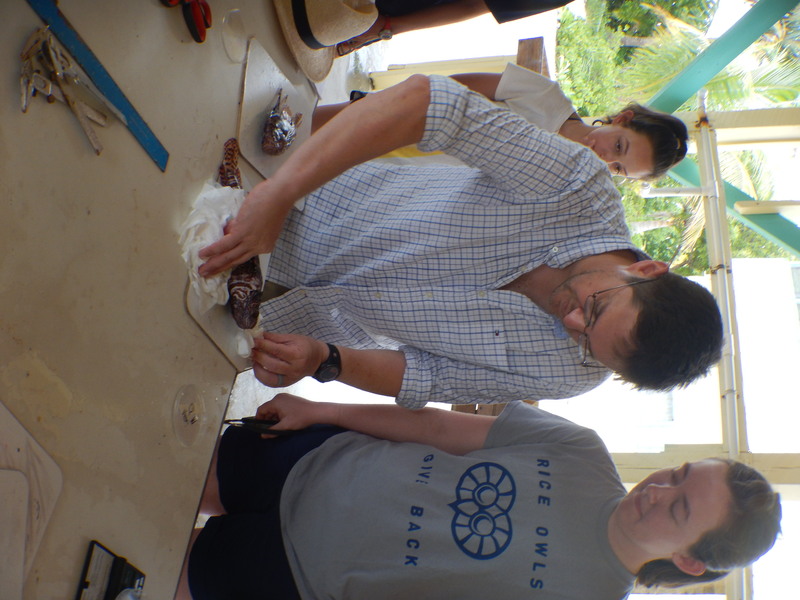 After snorkeling all morning, we had lunch and then got to do another fun activity; we dissected the six lionfish that Scott had caught over the course of the week. Deepu and I named ours Monroe Buckingham, because he was a classy fish even though he was invasive. 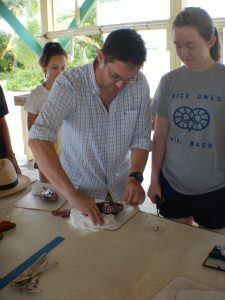 After collecting data about the lionfish, including the contents of their stomach, Scott cut them up and we made a ceviche out of their meat. We brought this ceviche to a neighboring island called Marisol where we stayed for an hour and a half enjoying ourselves. 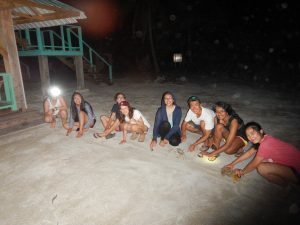 We then returned to eat dinner and present our lionfish findings. It is unfortunate that we have to leave Glover’s tomorrow morning. I enjoy living out here on a small island, very isolated from the stresses of the world but still working hard. I’ll miss jumping into the sea every day, but I am excited for what the forest has to offer for us. Another day in paradise. I tried waking up early to see the sunset, but a small cloud somehow managed to obscure the sun for most of it. I sat in the hammocks for a bit after, and then went to breakfast. Our first snorkel of the day took us out to a patch reef on the other side of Middle Caye, where we collected as many organisms as we could. This snorkel was special for me because I saw an innumerable amount of Caribbean Giant Anemones (Condylactis gigantea) and Sun Anemones (Stichodactyla helianthus), and even one Corkscrew Anemone (Bartholomea annulatus). I did not, however, see any zoanthids or corallimorphs today. On our snorkel, we collected lots of different organisms, including a tiny baby octopus that our group nicknamed Squishy. We enjoyed playing with it for a few hours as we identified all the organisms we collected. Unfortunately, we had also found that a tiny hermit crab we found living with a piece of trash yesterday, aptly named Trash Crab, had died today, so we plan to give it a funeral at sea tomorrow. After sorting through our organisms and eating, we wrote up the data for our marine debris collection from yesterday, before taking a quick snorkel in the patch reef near the Middle Caye dock. I saw one Sun Anemone here, but no more of my taxon group. After snorkeling, we had a delicious dinner followed up with another night of free time. It is hard to believe we are leaving in two days, but I will just have to soak up tomorrow as much as possible.